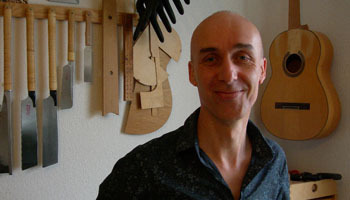 In the following years I worked for a Guitar Repair Shop a Guitar Dealer and a Violinmaker in Munich. In 2007 I opened my own workshop where, in the beginning, I built Classical as well as Archtop Guitars. Nowadays I have focused on the construction of traditional Classical Guitars. My Guitars are born through a long and intensive building process, one at a time, using handtools only. With each new Guitar I try to excel my own abilities.